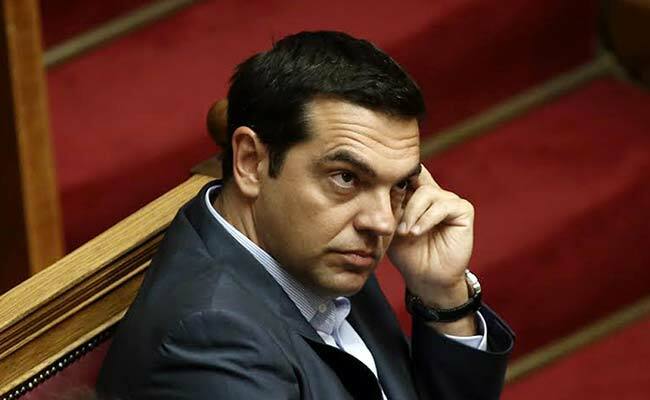 Athens: Greek Prime Minister Alexis Tsipras faced the widest rebellion yet from his leftist lawmakers as parliament approved a new bailout programme on Friday, forcing him to consider a confidence vote that could pave the way for early elections. After lawmakers bickered for much of the night on procedural matters, Tsipras comfortably won the vote on the country's third financial rescue by foreign creditors in five years thanks to support from pro-euro opposition parties. That cleared the way for euro zone finance ministers to approve the deal totalling 86 billion euros ($95 billion) over three years. This they did on Friday evening, albeit with stringent conditions. The vote laid bare the anger within Tsipras's leftist Syriza party at the austerity measures and reforms which he accepted in exchange for the bailout loans. Altogether 43 lawmakers - or nearly a third of Syriza deputies - voted against or abstained. The unexpectedly large contingent of dissenters, including former finance minister Yanis Varoufakis, heaped pressure on Tsipras to clear the rebels swiftly from his party and call early elections in the hope of locking in popular support. Tsipras remains hugely popular in Greece for trying to stand up to Germany's insistence on austerity before relenting under the threat of a euro zone exit. He would be expected to win again if snap polls were held now, given an opposition that is in disarray. "I do not regret my decision to compromise," Tsipras said in parliament as he defended the bailout from euro zone and International Monetary Fund creditors. "We undertook the responsibility to stay alive over choosing suicide." But the vote left the government with support from within its own coalition below the threshold of 120 votes in the 300-seat chamber, the minimum needed to command a majority and survive a confidence vote if others abstain. In response, government officials said Tsipras was expected to call a confidence vote in parliament after Greece makes a debt payment to the European Central Bank on Aug. 20 - a move that could trigger the government's collapse and snap elections. A senior lawmaker, Makis Voridis, from the opposition New Democracy said his party would vote against Tsipras's coalition, raising the odds it would be toppled. Still, some of those who rebelled on Friday could still opt to support the government in a confidence vote, as could other pro-European parties such as the centrist Potami and the centre-left PASOK, leaving the final outcome unclear. Friday's vote was only the latest in a series of events highlighting the rift within Syriza, which stormed to power this year on a pledge to end austerity once and for all, before Tsipras accepted the new bailout to avoid a banking collapse. The leader of Syriza's far-left rebel faction, former energy minister Panagiotis Lafazanis, took a step toward breaking away from the party by calling for a new anti-bailout movement. "Syriza accepted a new, third bailout - austerity that goes against its programme and pledges," Lafazanis told Efimerida Ton Syntakton newspaper, adding that this "will open the way for a mutation of Syriza with an uncertain ending". Syriza would be weakened by the departure of the faction led by Lafazanis. "While an early election could be helpful in terms of removing hardliners from a Tsipras-led Syriza and, possibly, forcing the party to adopt a more centrist stance, the most likely outcome will be another fragmented parliament in which no party controls an absolute majority," said Wolfgango Piccoli, an analyst at Teneo Intelligence. "This means that the 'new' Syriza - the party likely to win the largest amount of votes and seats - will have to strike another coalition deal to govern." Following the ministers' approval, the deal needs ratification by Greece's euro zone peers, notably by parliament in Germany - the biggest contributor to Greece's bailouts and where public opinion opposes lending any more money to Athens. Once the final hurdles have been overcome, aid can start to flow so that Athens can make the 3.2 billion euro debt payment to the ECB on Thursday and avoid a default. Other more long-term concerns also remain. The IMF has made clear it would participate in the programme only if Europe agreed to ease Greece's huge debt burden. Berlin opposes writing off any Greek state debt, although it is open to the idea of extending grace periods before Athens has to start paying interest and principal on its bailout loans.